Learn how Erlsten Brothers got their start and how they grew to the company they are today. Erlsten Brothers Maple Products sells everything for amateur and commercial maple production. Containers, tubing, fittings, new and used equipment are for sale. Ohio's best maple syrup is available all year in small and large quantities. In 1985 Mark Erlsten started Erlsten Brothers as a backyard syrup producer. With farms in Morrow County the business grew quickly. 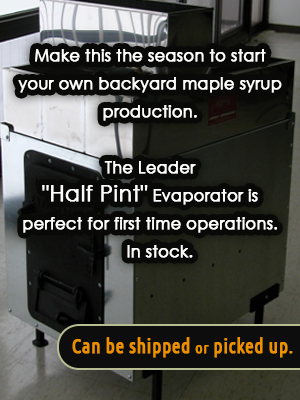 In 1992 we became an authorized dealer for Leader Evaporator providing equipment and supplies for maple producers of all sizes. In 2007 we added a tubing consultation and installation service. In partnership with Leader Evaporator we have designed and installed some of the highest producing systems in the state of Ohio. Your woods is capable of making these huge crops of syrup with the right tubing system and proper installation. Call us today to schedule a woods walk. More product on hand for this season than ever before! Call for an appointment anytime you are in the area.